Spending time at the beginning of the year practicing library procedures with students is essential for a successful year. 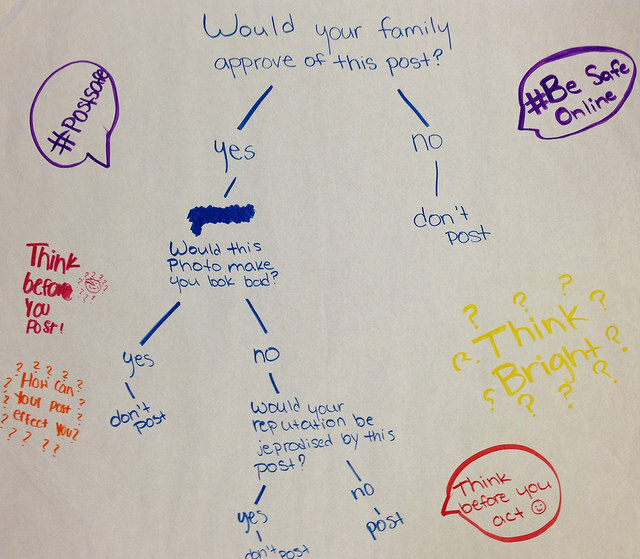 I love my 8th graders this time of year, because they’ve got the procedures down. They know exactly how our library functions and they’re leaders who model the procedures to new students. Particularly with self check-out and return in place, I really have to drill those procedures with students so things run smoothly. It’s just me running the show in our library — no assistant with over 1000 students at our school — so self check-out is the only way that the library can stay open for circulation all day every day. Every year, I like to schedule my 8th graders for the first library visits. I feel like it’s only fair that they have first dibs on checking out books (because once 1000 students come through, the shelves start looking a little bare). Instead of droning on about library procedures with my 8th graders this year, I had them help me put together a video to review procedures with 7th grade and introduce them to the new 6th graders. My 6th graders came in this week for their second visit and they’re starting to get the hang of our procedures. I used this Kahoot to review with them. I will continue to review them and sound like a broken record (“Scan your ID first to check out”) until this library runs like a well-oiled machine. 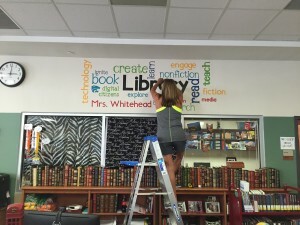 Three years ago during July of 2012, I posted about our library wall quotes and word cloud that I put up when we moved into the new library. Just three years later, and I felt like it was time for a change. For the past several years, the library has been decked out in neon colors and zebra print, which I loved and has been a lot of fun. A few things lead me to the decision to redecorate the library. First, I was lucky enough to hear Erin Klein speak at the Arkansas Association of Instructional Media conference this spring. Erin also did a TL Virtual Cafe webinar on Classroom Cribs. She talks a lot about creating an inviting space where all students feel welcome and comfortable. Although my students absolutely loved our library as it was, I knew that I could do more to make it more appealing to both genders and not so “girly.” I’m also currently reading Dave Burgess’ book Teach Like a Pirate. He talks a great deal about incorporating your passions into your teaching practice as much as possible. I took inspiration from both of these awesome educators and decided to revamp the library with a travel theme — anyone who knows me knows that I’m passionate about travel. Plus reading and travel are a perfect pairing, don’t you think? 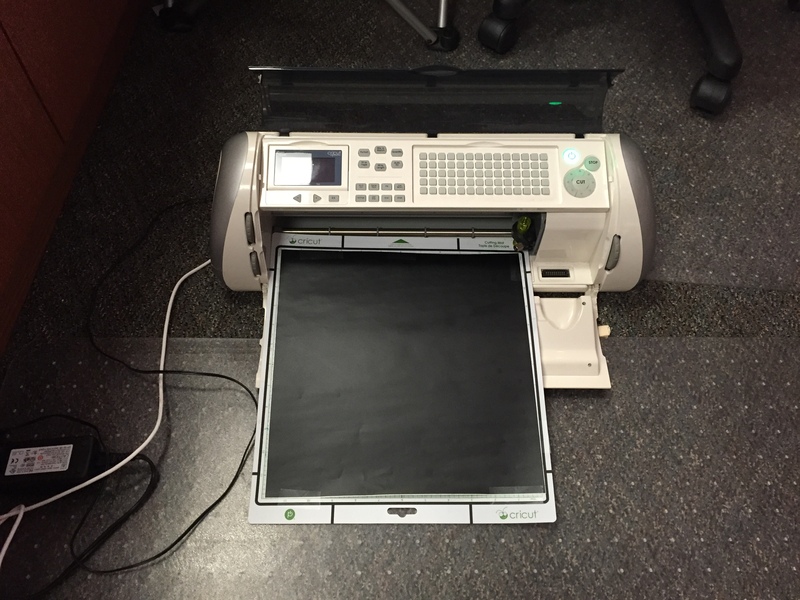 Our PTO purchased a Cricut Expression machine years ago. I used it the first time we put up quotes. 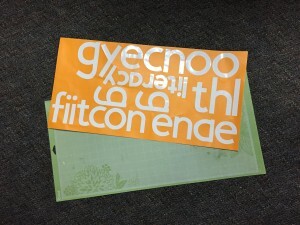 It is great for cutting vinyl and crafting with card stock. 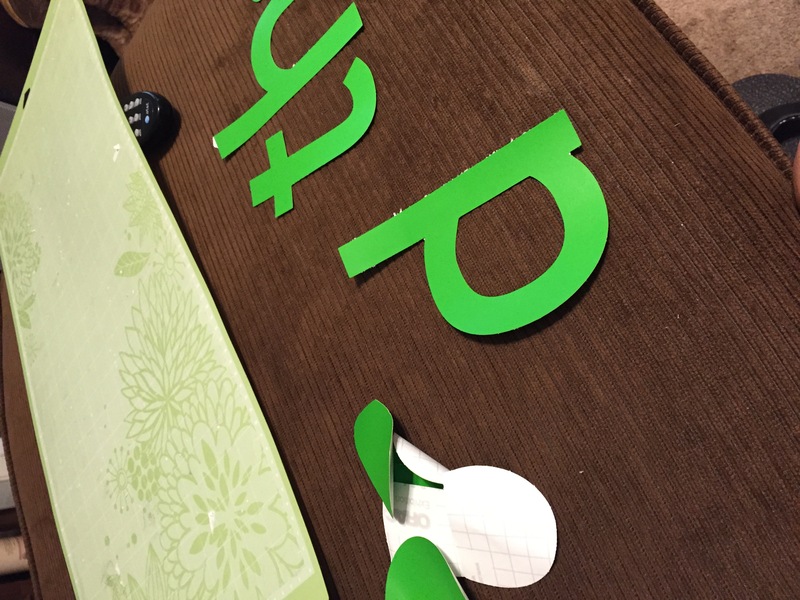 Purchasing a USB cable and downloading Cricut Craft Room saved me a lot of time in the layout and cutting process, but this is still VERY time consuming. I brought the machine home and cut out the quotes over the course of about a week — and I spent MANY hours working on it during that time. 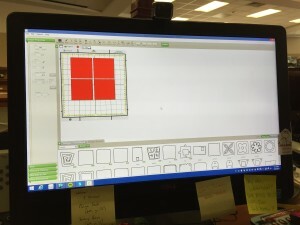 I prefer to use the 12×24 mat and order sheets of vinyl that size from ExpressionsVinyl.com. They have a large selection of colors and I’ve been more than pleased every time I order from them. In the picture above, you can see that blade of the Cricut wasn’t set very deep — it didn’t cut through the backing, just the vinyl. When I cut out the quotes, I had it cut deeper so I could lay out the quotes and make sure none of the letters are missing. It’s kind of crazy how trying to fit as many letters as possible on a sheet and make sure you end up with all of the right words and punctuation can blow your mind! 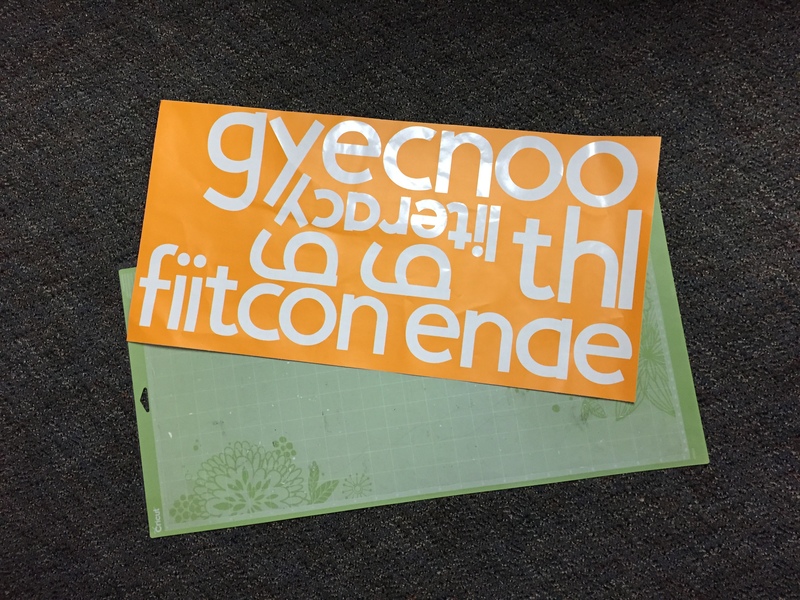 I’ve purchased the vinyl transfer paper before, but never actually used it. 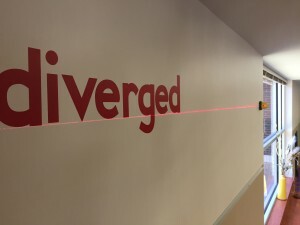 Instead, we invested in this handy little laser level. We use 3M Command Strips to stick it to the wall and shoot a line. Then the letters go up one by one. They peel back up from the wall pretty easily without tearing if you have to adjust them…which you will. Often. 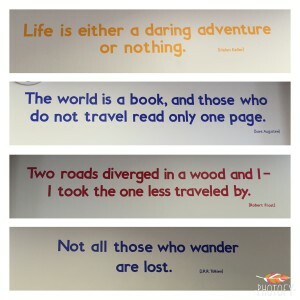 I spent pretty much an entire day up on the ladder putting up the quotes with the help of my awesome mom. I’m so happy with how they all turned out! 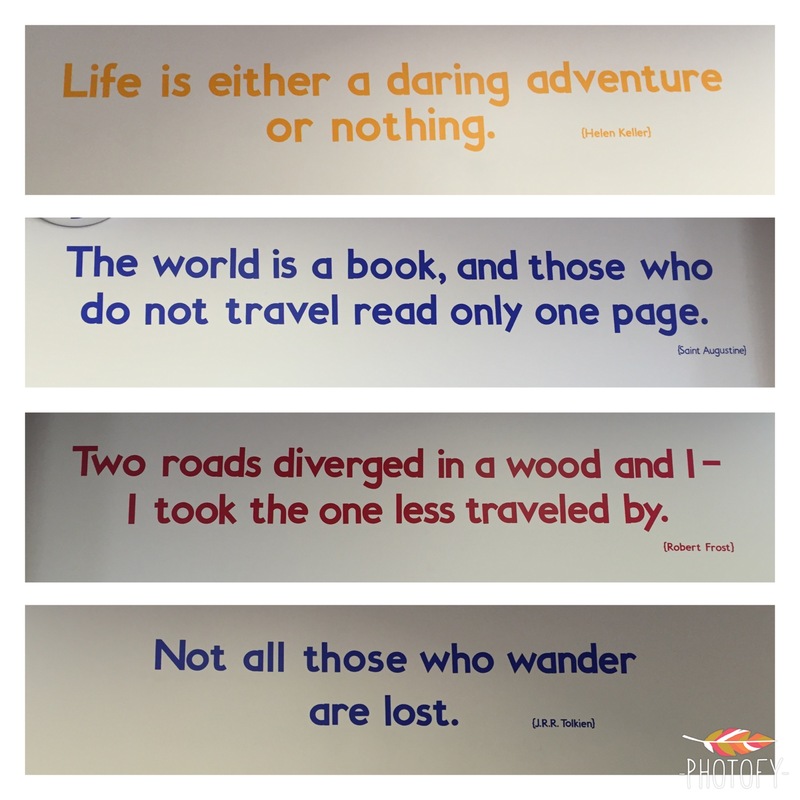 I went with these five travel and reading themed quotes…I love each one of them dearly and hope they will speak to my students, too. We even changed some of the font and color of the words in the word cloud above the circulation desk. The finishing touches on the rest of the space are still underway and I can’t wait to post again soon with the rest of the details! 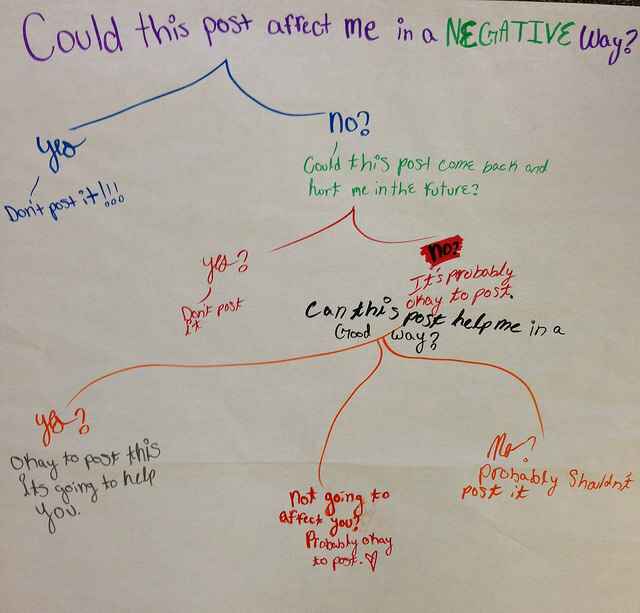 I’ve been struggling with the idea of writing this post. 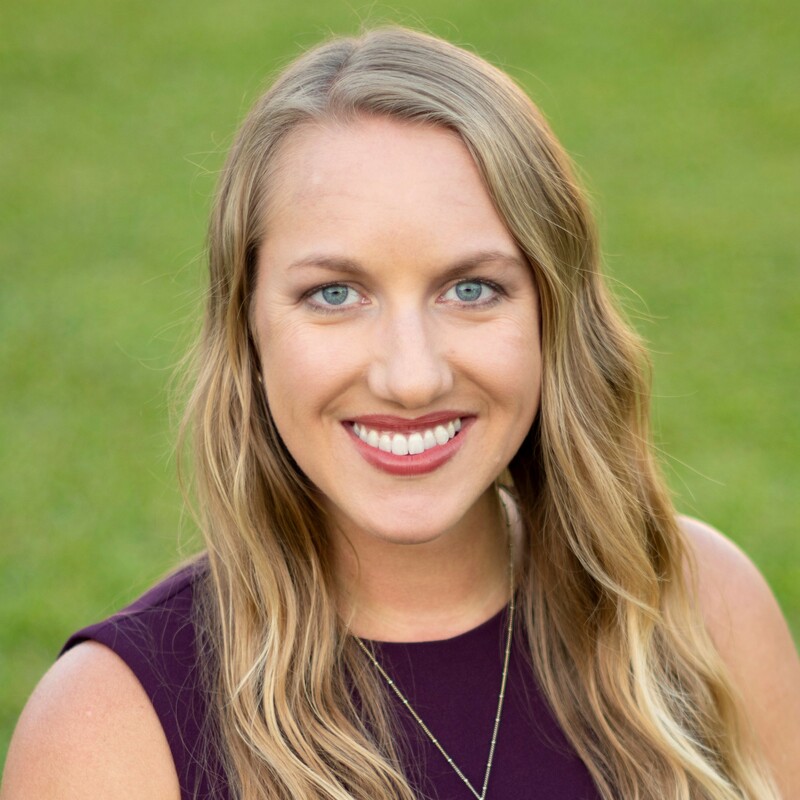 I don’t want to come across as a complainer…I am incredibly blessed to have a career I love, and I feel that my hard work and commitment to my profession has paid off tremendously in the past few years. We all go through slumps at some point, and I feel like I’ve been having one these past few months. As I reflect on what it feels like to not have the success that I’m always striving for, I think about what it feels like for our students. When you try so hard, give something everything you’ve got, and then come up short, it’s hard to stay positive. Often as educators, we don’t put ourselves out there and apply for grants/awards/etc. because we might not get it. And when you don’t, it stinks! It hurts! It’s upsetting! This year, we submitted our entry for the Follett Challenge and worked our tails off to promote our entry. We were so close! If we had been just a few spots higher in the voting, we would have won something. But we didn’t. I gave it my all, but that wasn’t enough in this case. We put together a great video and it was great publicity for our library program, but that doesn’t help with the sting of not winning. 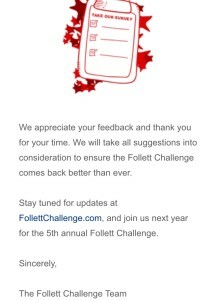 This was our second time entering the Follett Challenge. 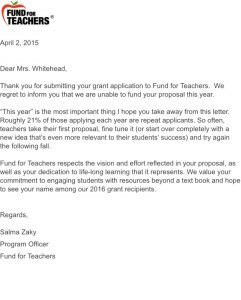 My best friend (who is also an ELA teacher at my school) and I wrote a Fund for Teachers grant this year. For almost two months, we stayed after school for 30-60 minutes most days of the week to research and write our grant. We put so much time, effort, and energy into writing this and were so pleased with what we submitted. We wrote this grant because we got an email about the seven submissions that were funded from our state the previous year, and they were seeking more entries from our area. 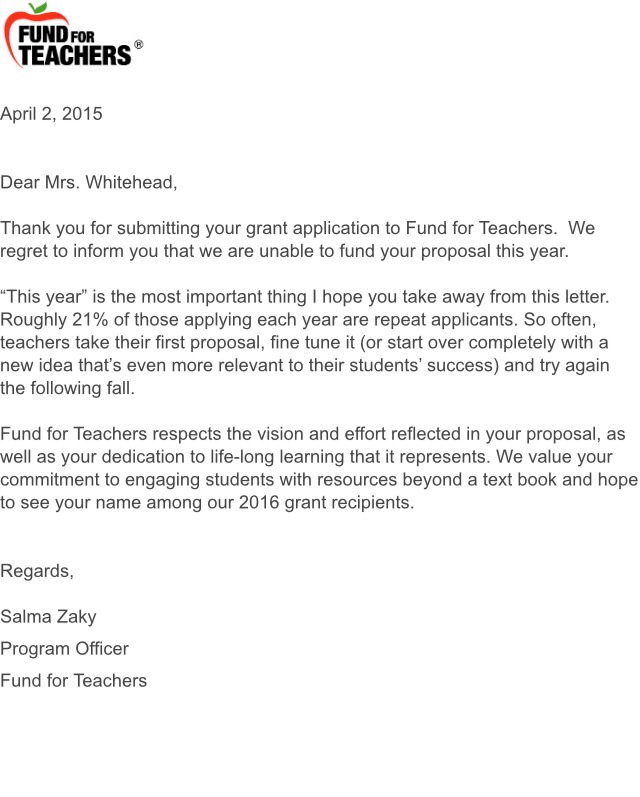 We were very hopeful and anxiously awaited the email that would let us know if we were funded. Alaina and I travel together every summer and were excited about the opportunity to travel and put together an awesome cross-curricular unit with the help of this grant. We didn’t make other travel plans for this summer, because we knew if we got the grant we wouldn’t be taking another trip. When we got this rejection letter and found out that only two projects were funded from our state, we were heartbroken. 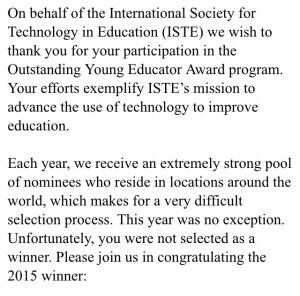 Last year, I was selected as one of ISTE’s 2014 Emerging Leaders…an incredible honor. I thought I would apply one last time (this was my third year applying) for the Outstanding Young Educator award. I’ve been very involved with the Librarians Network with ISTE for years. 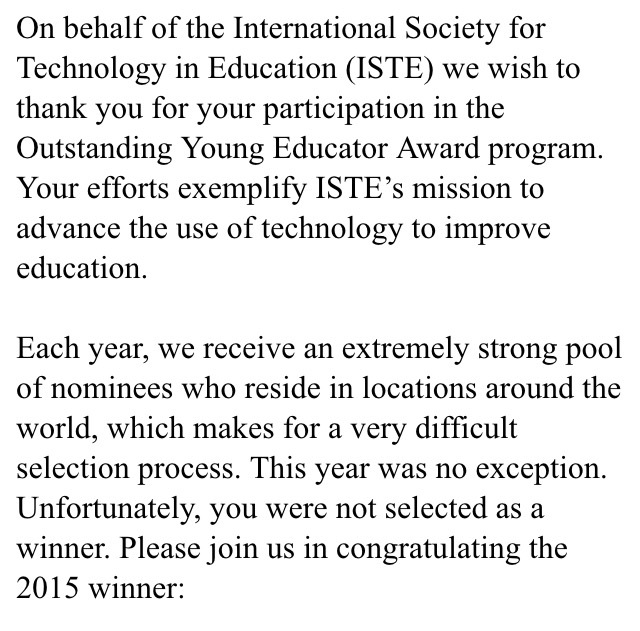 Our group is large and very active, so I really wanted to see a librarian recognized for one of ISTE’s big awards. Even when you aren’t surprised or devastated by a rejection, it still doesn’t feel great. This one stings the most! Two years ago in Hartford at AASL, was part of four awesome, packed out presentations. 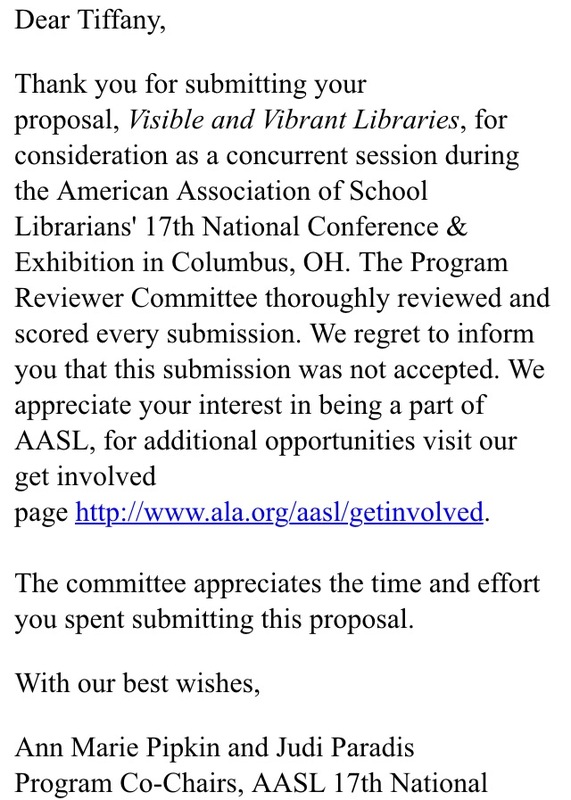 It was overwhelming to do so many presentations at a big conference, so I only submitted one proposal for AASL in Columbus. I thought it was a great session proposal and it included some of my library friends that I love and respect the most in our TL community. 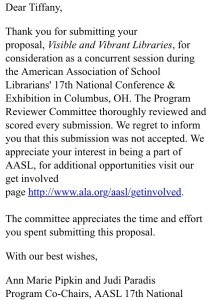 I’m so disappointed that I won’t be presenting in Columbus this fall. AASL is my absolute favorite conference and speaking is one of my favorite things to do (especially with a group of other awesome library leaders), and I’m beyond bummed that it won’t be happening this year. I think it’s important to be thoughtful and reflective at a time when pushing on and dusting yourself off just doesn’t feel so easy. At times like this, do I feel like I want to back off a bit and quit trying so hard? You bet I do. But what kind of example does that set for my students? How many of them feel like this all the time? They try so hard, put in their best effort, but they still fall short. How can we encourage those students to keep trying? So while I’ve experienced this feeling of not quite making it several times in the past few months, I’m trying to use it to gain some perspective. Relate this experience to my students so I can better connect with and encourage them. And most importantly…I’m going to keep trying and putting myself out there because that’s what I want them to do. 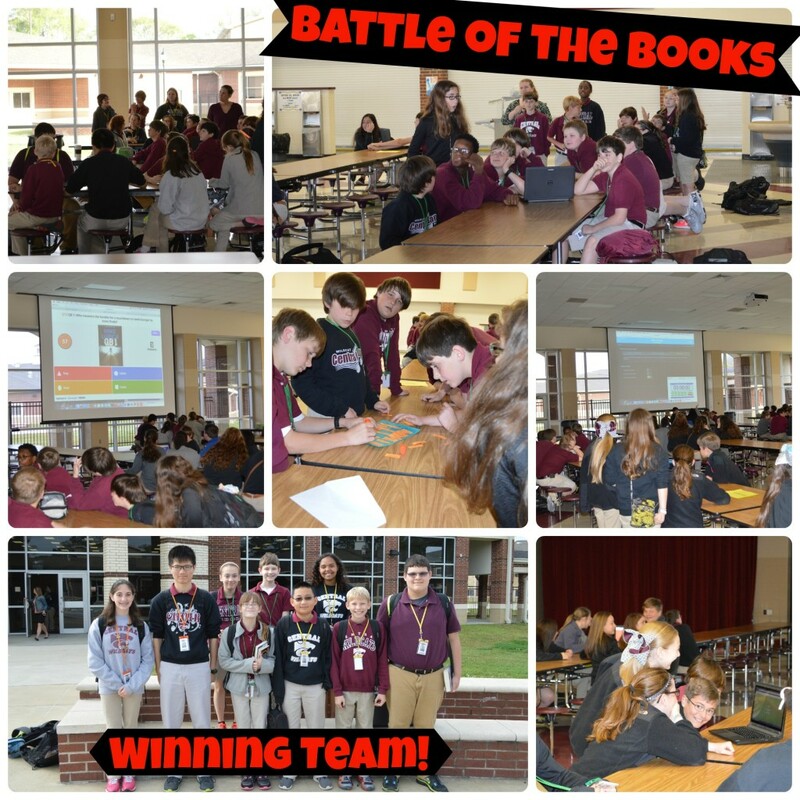 Today we hosted the first Battle of the Books at CMS! I’m beyond pleased with the way the event turned out and know this is going to become a favorite tradition at our school. I have to give a HUGE shout out to Sherry Gick who has been talking about her Battle of the Books for years, which inspired me to bring this awesome idea to CMS. Sherry and Megan Scott gave an ISTE Librarians Network Webinar on the Battle of the Books, which I recommend watching if you’re considering hosting this at your school. I started advertising for this event back in November. Students could get together teams of up to 10 students for the competition, then find a teacher to serve as their sponsor. I used funds from our book fair to purchase sets of the 10 titles for each team. A total of 13 teams signed up for the competition and they received their books in early December. Many of our team sponsors set up Schoology groups for their team members to discuss the books on the list. Students traded the books with team members to read. 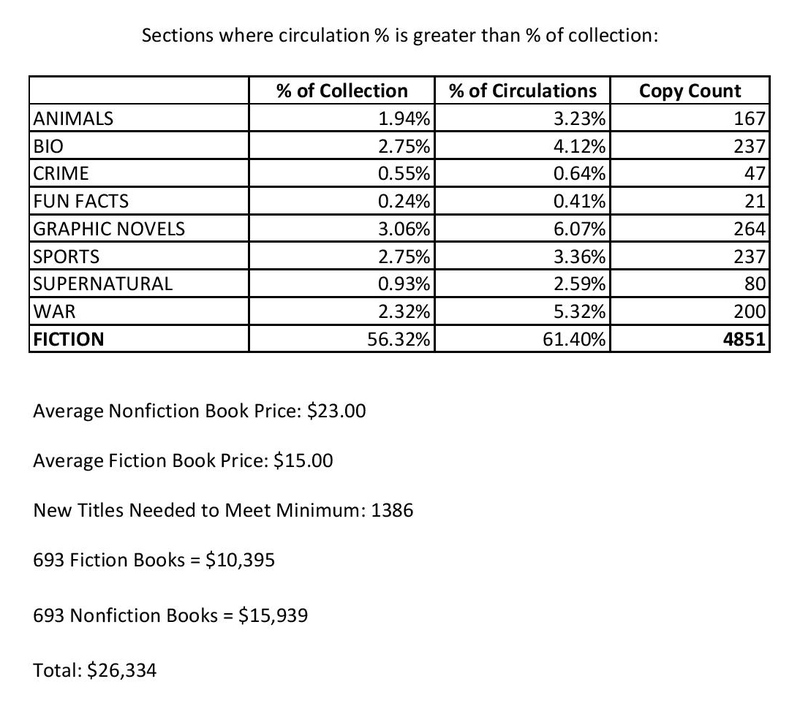 Some teams were very ambitious and tried to get as many students on their team to read as many books as possible — there were a number of students who read all 10 titles! Other teams assigned team members to be an expert on two or three titles. The winning team actually met after school several times to discuss the books and come up with their strategy…and clearly it paid off! Each team was allowed one computer for responding to the Kahoot and Socrative questions. I told them up front that if any monitoring teachers saw them with other windows/tabs open OR they had any of the books in sight, they would be disqualified from that round. We didn’t have any problems. Rounds 1 and 4 were Kahoot rounds — 20 multiple choice questions where speed and accuracy helped them earn points. Points were awarded based on final ranking after the round. The team in first place got 10 points, all the way on down to just one point. You can check out the Round 1 Kahoot here. The Kahoot rounds were so much fun and brought a lot of energy to the competition. Round 3 was a puzzle. 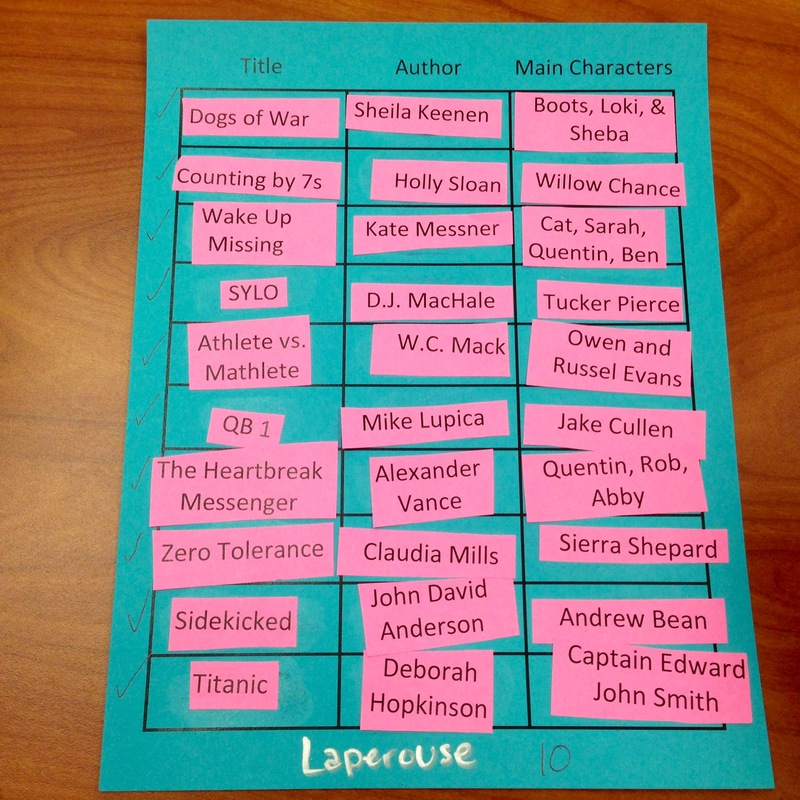 Teams had to match the title, author, and main character(s) from each of the 10 books in 5 minutes. We cut out each piece individually and put them in an envelope. Each team received an envelope, paper grid, and glue stick. Teams earned a point for every title/author/main character that was matched correctly. I can’t express my excitement enough over the success of our Battle of the Books! With the help of my awesome administration and super supportive coworkers, things went even better than I hoped. Next year, I plan to move this event to the fall semester and maybe host the battle after school. I’ve already heard talk of recruiting and strategizing for next year’s teams. 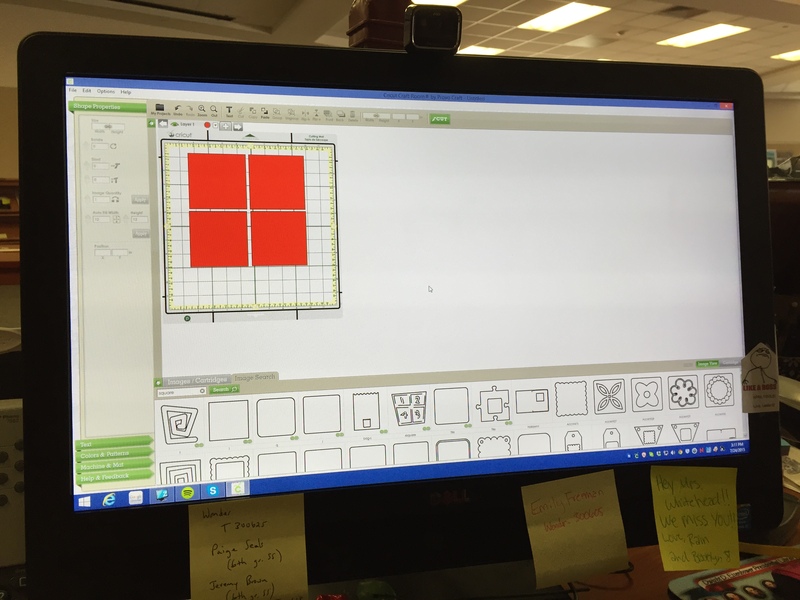 In the words of a student who sent me a message on Schoology after the battle…It was EPIC! As librarians, I believe it is essential that we view ourselves as leaders in our schools. We all know the best leaders lead by example (not with a do as I say, not as I do attitude). Not only must we be digital role models for our students, showing them what strong digital footprints and a positive online presence looks like, but we must also do the same for our fellow teachers as well. One of my favorite things to do in the library is to promote technology through professional development for my teachers. This isn’t necessarily a role that was expected of me as the librarian, but it is one that I’ve created and developed for myself because I felt it was so important. When I took my current position as middle school librarian, one of my first PD offerings was a Library Tech Petting Zoo. I share this PD idea often, because for me it really helped to set the tone for myself as a leader and collaborator in my school. 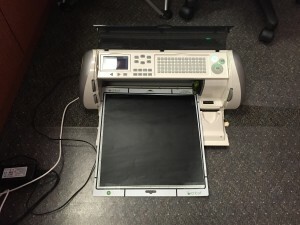 Numerous collaborative technology projects were born from this fun and informal professional development, and it helped me to lay the ground work for some great relationships with my new coworkers. The 2014-2015 school year has been a great one for PD at CMS. 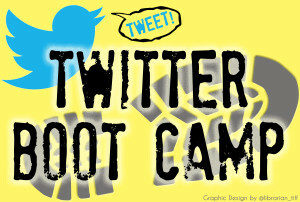 This fall, I offered several sessions of a Twitter Boot Camp for my teachers. 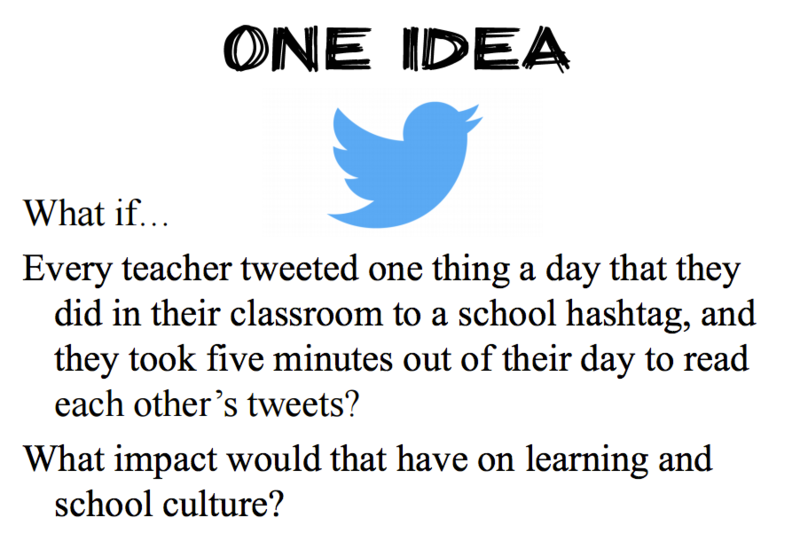 I did short, 30-minute sessions that gave teachers time to get their feet wet with Twitter. We talked about the basics — hashtags, general Tweets vs. Tweeting to specific people, following people to build a PLN, and Twitter chats. My goal was to introduce teachers to the wealth of information that’s constantly being shared by educators on Twitter without completely overwhelming them. 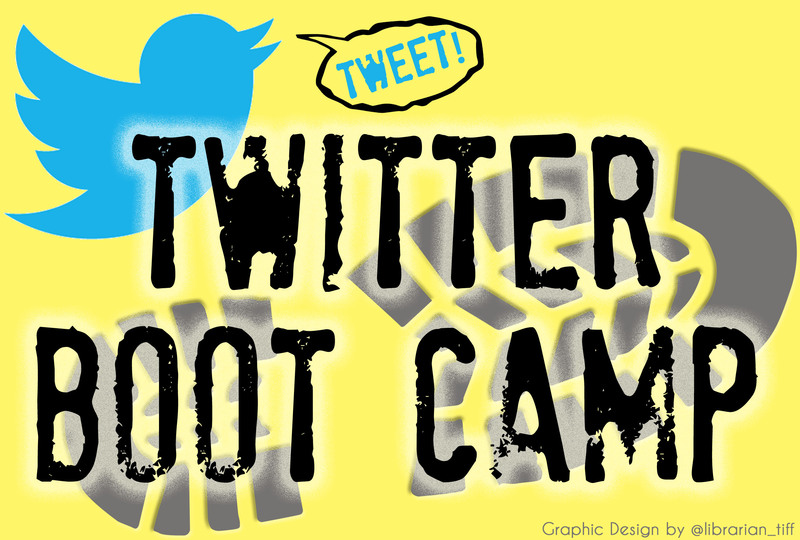 Even though it’s been several months since these Boot Camp sessions, I had a teacher come into the library just this week to thank me and tell me that she’s been getting some great resources and making connections on Twitter. As the only Spanish teacher in the building, the idea of creating her own Professional Learning Community online really resonated with her. #WINNING! Another huge PD win this year at CMS has been EdCamp. 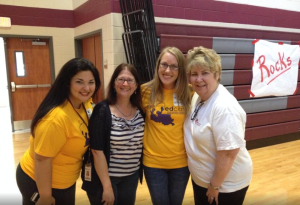 Back in 2011, I worked with some awesome New Orleans educators to help host the first EdCamp in Louisiana. One of my goals for 2014 was to host an EdCamp in Baton Rouge. With the help of my principal and some great CMS teachers, we hosted EdCamp Baton Rouge at the end of September. This was the first EdCamp for all of my CMS folks, including my administrators, so they were unsure of what to expect. Thankfully, some of my NOLA friends came up Baton Rouge to support us and our event. It was a great day of learning; many of my coworkers said it was the best professional development they’d ever experienced. My principal liked the EdCamp model so much that we recently used it to host a mini-EdCamp on our February teacher-only PD day. Our teachers loved the opportunity to take ownership of their learning and participate in facilitated discussions on topics that were relevant and timely for them. After the rave reviews of this PD model, I know that we will host more of these events on school and district PD days. I’m also looking forward to an even bigger turn out for our 2015 EdCamp Baton Rouge that we will host again in the fall. In the last several years, I’ve taken my love for PD and sharing beyond the walls of my school. I love to learn and share with other educators, evangelizing about the use of technology in education and the constantly evolving roles of libraries. I’ve been honored to speak at a number of state library and technology conferences, sharing the importance of librarians being technology leaders and role models in their schools. One presentation that I think is worth revisiting that’s relevant to this topic is the TL Virtual Cafe webinar that the fabulous Tamara Cox and I presented on PD with a Twist. I’ve also presented on this topic several times at conferences, because I think it’s so important for librarians to be professional development leaders in their schools. An important part of my job is to stay on top of current tools and resources available to teachers and share those resources with the teachers who need them. With the stresses that my teachers are facing with curriculum changes and new assessments, I feel like making their life a little easier by sifting through tech resources and sharing just the best tools with them is so important. Is the position of school librarian viewed as a leadership role in your school? What are some creative ways that you’re stepping up your game as a leader and offering great PD and resources to your teachers? I hope you’ll join me tomorrow night (February 2nd) at 8PM Eastern for the February TL Virtual Cafe Webinar. 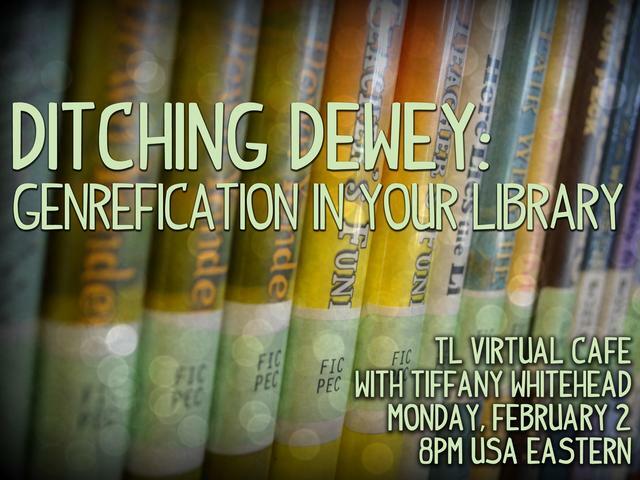 I’ll be discussing one of my FAVORITE topics…Ditching Dewey! 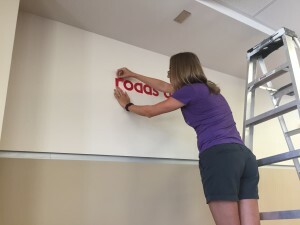 I’ll be sharing in details the steps I took throughout the entire process of genrefying our library — both fiction and nonfiction. I get questions about this regularly, so I’m really excited to share about this in the awesome TL Cafe setting! Find more details, including the link to join the webinar, on the session page. Also visit the session page afterwards for the webinar archive. Okay dear readers, I need your help and support! 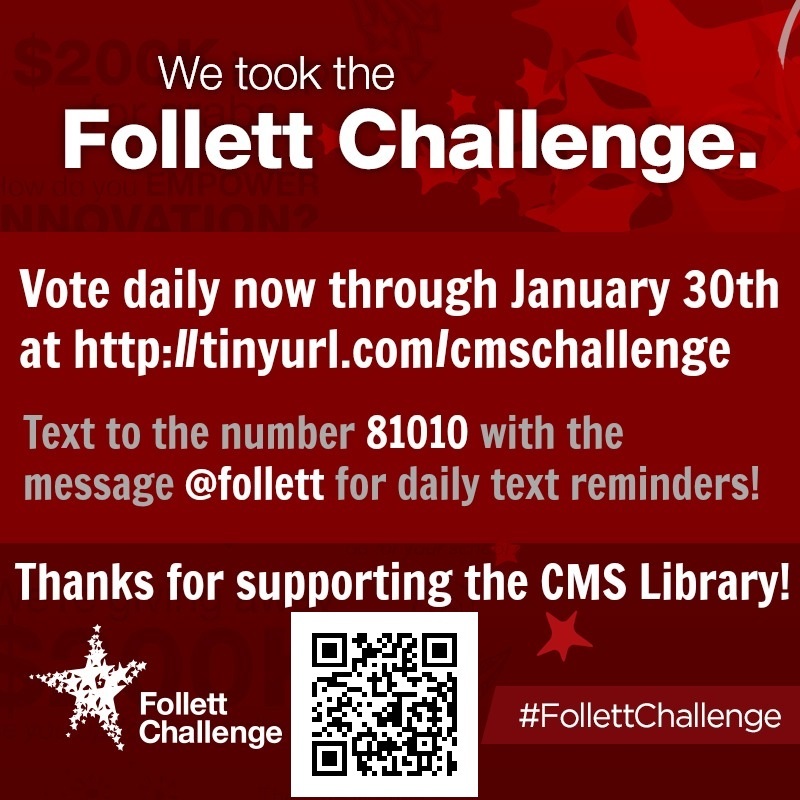 The Central Middle School library has once again entered the Follett Challenge, and we need you to VOTE! Please follow this link to view our video entry and cast a vote for our submission. 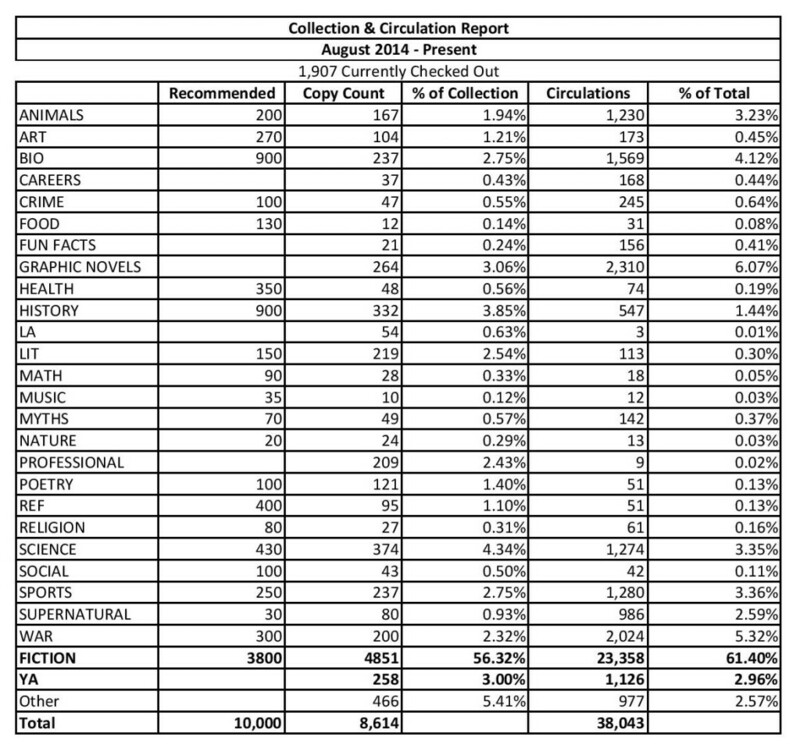 As I know is true with all of the 114 entries into this year’s Follett Challenge, we put a lot of work into this entry and really want to see it win! This was an especially reflective process for me, because we entered the Follett Challenge in 2011. Thinking back to that entry 4 years ago and comparing it to this year’s entry, I realize how much our library program has grown! 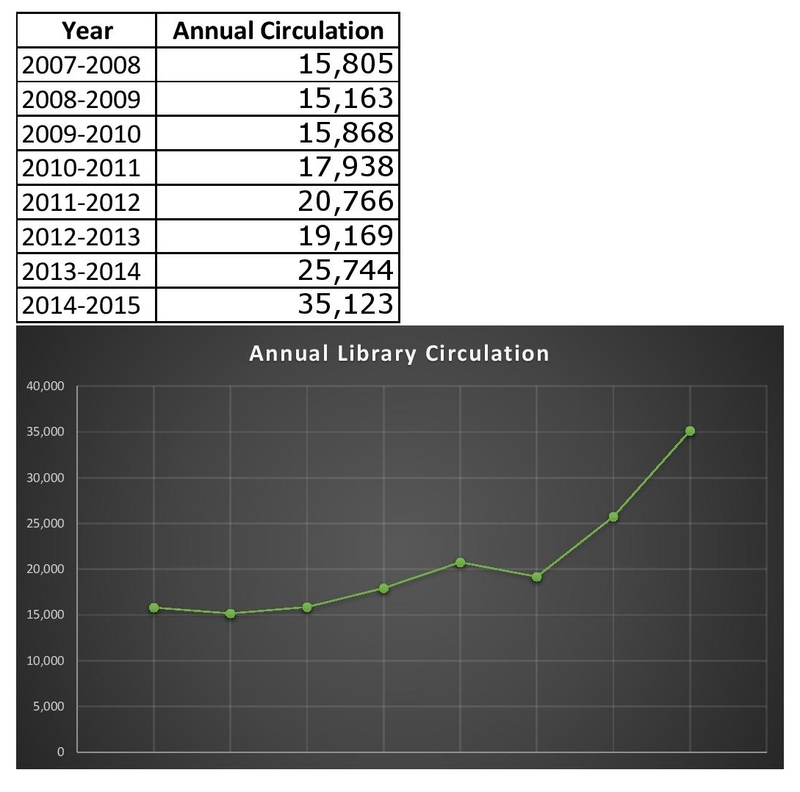 Our reading promotion, genrefication, self check-out, and makerspace have really transformed our library, and I’m so proud of how far we’ve come. 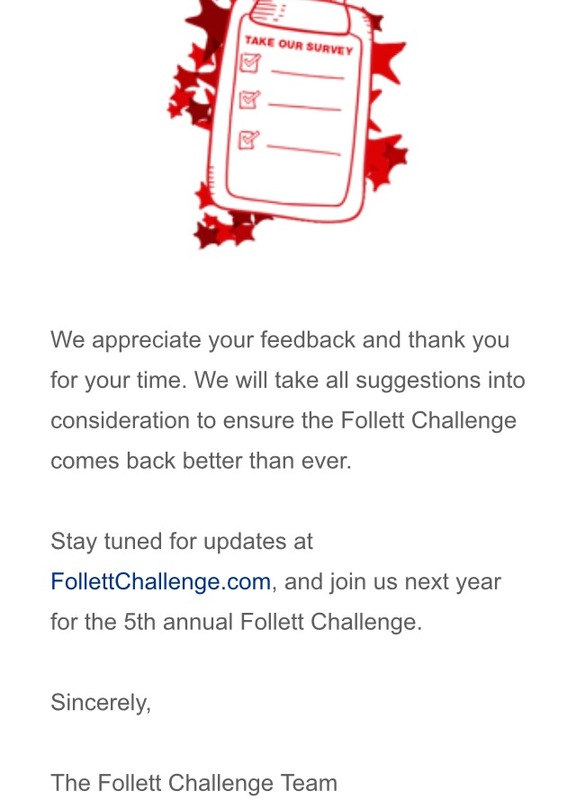 So help us celebrate our progress by voting for our entry in the Follett Challenge!